Camping in Shimla: Shimla is a hill station which is the capital of Himachal Pradesh in India. In the pre-independence stage, it was the summer capital of the British Empire. It is located in the middle Himalayas which is popularly known as Himachal. The city derives its name from goddess 'Shyamala Devi', an incarnation of Kali. Shimla is a popular tourist destination in India and people flock the place especially in the summer season. Its idyllic setting, the rugged mountainous terrain, charming snowfall and pleasant weather has paved the path for the tourists and trekkers to practice Camping in Himachal Pradesh in India. There are attractive places which offer opportunity for Camping in Shimla in India. Numerous packages are also available for this purpose. Some of the well known hot-spots for Camping at Shimla in India are: Shogi, Mashobra, Fagu, Summwe Hill etc. Camping in Chail: Chail lies at a height of 2,250 metres above the sea level. Chail was perfect - it was surrounded by a thick cover of majestic, soaring deodars, Simla was just 45 kms away, and most significantly, the hill of Chail was decidedly higher than the then British - controlled Shimla. Chail has alsothe highest cricket ground in the world. Well kept and well maintained the ground is surrounded by huge trees of deodar and pine. Our Campsite is located 43 km from Shimla in a beautiful city named Chail. We have 20 luxury Swiss tents with all modern amenities including an attached tiled bathroom with 24 hours hot and cold shower. We have lots of option of Camping in Himachal Pradesh for nature lovers. Camping in Manali: Manali A famous tourist destination in Himachal Pradesh is just 40 kms away from Kullu to the north, Manali is situated near the end of the valley on the National Highway leading to Leh. The landscape here is breath taking. One sees well-defined snow capped peaks, the Beas river with its clear water meanders through the town. On the other side are deodar and pine trees, tiny fields and fruit orchards. It is an excellent place for a holiday, a favorite resort for trekkers to Lahaul, Spiti, Bara Bhangal (Kangra), and Zanskar ranges. From temples to antiquity, to picturesque sight-seeing spots and adventure activities, Manali is a popular resort for all seasons and for all travellers as well as for camping location in himachal pradesh. Camping in Kullu: Kullu A famous tourist destination situated at an altitude of 1,219 meters from sea level, Manali is situated near the end of the valley on the National Highway leading to Leh. The landscape here is breath taking. One sees well-defined snow capped peaks, the Beas river with its clear water meanders through the town. On the other side are deodar and pine trees, tiny fields and fruit orchards. It is an excellent place for a holiday, a favorite resort for trekkers to Lahaul, Spiti, Bara Bhangal (Kangra), and Zanskar ranges. From temples to antiquity, to picturesque sight-seeing spots and adventure activities. Camping in Kullu or Camping in Himachal Pradesh are from April to middle of June and from the middle of September to the first half of October. Warm clothes are highly recommended. Camping in Sangla Valley: Our campsite is located at a height of 2600m from sea level. Sangla valley is considered Kinnaurs most beautiful site with the massive Kinner Kailash peak towering over it. 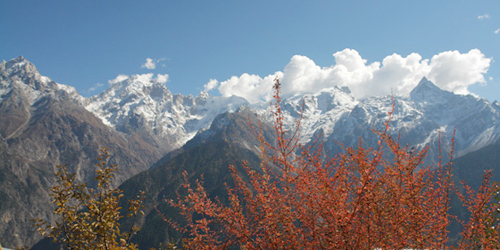 The slopes of this valley are covered with cedar, pine ,walnut, apricot trees, apple orchards, fields and picturesque hamlets.The Baspa river which originates in the valley flows west through it to meet the main river Satluj at Karchham Sangla Valley is adorned with the beautiful villages of Chitkul, Batseri, Kamru, Raksham and Chasang. The village houses are an epitome of wooden craftsmanship.The religion of the people is a remarkable mix of Hinduism and Buddhism. Sangla Campsite Situated in the lush green forests of cedar and pine it provides luxury tented accommodation and also offers a multitude of other Adventurous Activities like Rock Climbing, Rappelling, Nature Trails, bird watching and River Crossing. So Sangla Valley is also best option for Camping in Himachal Pradesh. Camping in Solang Valley: Camping in Himachal Pradesh is the best way to have the adventure in the lap of the nature. Dare Adventures make arrangements for tent accommodation in particular camping at Solang Valley. Camping in Solang Valley packages offered by us have complete range of adventure activities available in Solang Valley. The options may include food, lodging, adventure activities and bonfire. The best months of the year for Camping in Solang Valley are from March to middle of September to the first half of November. Camping in Dalhousie: Dalhousie is one hill station which is increasingly becoming popular among home and foreign tourists. Nestled on the spur at the western end of Dhauladhar, Dalhousie was founded in 1854 by the British Viceroy Lord Dalhousie. It is an absolute delight for trekkers and nature lovers. Beside its breath taking landscapes and lush green forests of pine, cedar and deodar the un-spoiled and raw natural beauty attracts the most. Set on five hills and facing the Pir Panjal range, one can view the earth and sky kissing on the horizon. Fold after fold of mountains, snow-capped and pristine, can be viewed from the jagged Pangi Valley. So Camping in Dalhousie is best option for adventure camping in himachal pradesh. Camping in Dharamsala: Camping in Himachal Pradesh is the best way to have the adventure in the lap of the nature. Dare Adventures make arrangements for tent accommodation in particular camping at Dharamsala. Camping in Dharamsala packages offered by us have complete range of adventure activities available in Dharamsala. The options may include food, lodging, adventure activities and bonfire. The best months of the year for Camping in Dharamsala are from March to middle of September to the first half of November.